The Team Duster baseball style cap is embroidered with Yellow and Blue stiching. The Air Tractor Image is one of the best duplications we have seen on a cap. The website address is displayed over the left ear. Price is $12.00. The Construction Photo CD features approx. 475 building photos of the 1/6 scale AT 502B. It also contains approx. 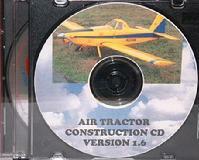 65 documentation photos of the Full Scale Air Tractor. CD is FREE with the purchase of a set of plans or $10.00 when ordered separately. For a sample of the photos on the AT502B-100 Construction CD you may click on any of the thumbnails below.